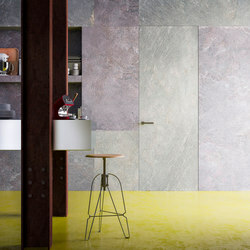 Behind our work there’s a hidden Italian story of experience exclusive design. 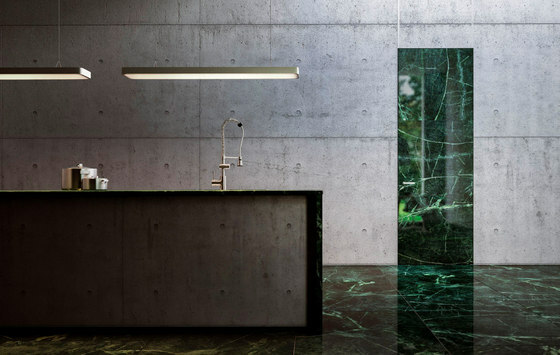 The precise technical know-how is masked by the apparent simplicity of the flush-to-wall door that, combined with a maximum level of “customization”, allows fulfilling the most demanding aesthetical desires and functional expectations. 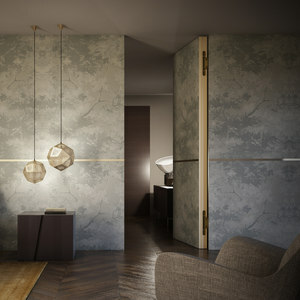 Linvisibile is an exclusive patented system of doors and technical closures fitted perfectly flush with the wall that does away with the need to fit visible jambs, wire covering frames and on sight hinges, so that to ensure flawless moving parts and smooth opening. An evolved “made-to-measure” concept endlessly spreading the same idea of ‘door’, therefore redeemed from any restriction in project planning. 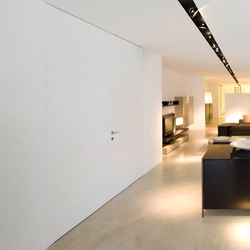 Sizes, shapes and finishes represent for Linvisibile not limits, rather brand new creative possibilities. The perfect alignment effect offered by Linvisibile gives the designer the chance to express and convey tangibility and reality to his own idea of architectural and functional space, both in case of a wholly uniform sensation and a marked visual geometry. 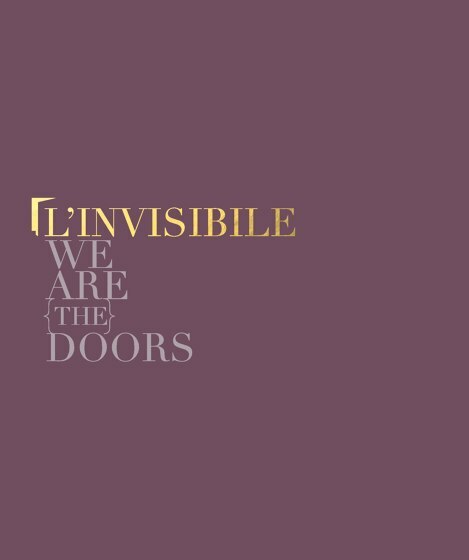 The Linvisibile product range - comprised of Alba | FILO 10 Hinged door, Alba | Hinged door, Alba | Fire Resistant Hinged door, Alba | Curved Hinged door, Marea |Concealed Sliding door, Marea | Pocket door, Brezza | Vertical Pivot door and Brezza | FILO 10 Vertical Pivot door, Nicchio, Extra – Closures, Special Openings, Orizzonte | Boiserie and Skirting systems – can indeed become indistinguishable from the architectural wall selecting any type of decor or wall painting or either be given light through the choice of glossy and matt lacquering, precious woods and any other kind of covering material. 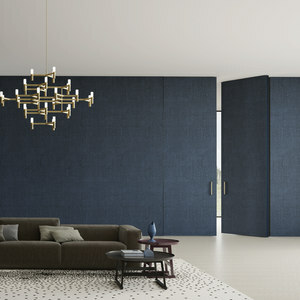 Linvisibile was created in 1994 out of the experience of Portarredo Srl, an Italian company founded in the early 80’s that specialises in manufacturing doors and locking systems featuring exclusive designs and materials. Portarredo distinguished itself from the very beginning thanks to the fully developed technological value of its products, and succeeded in earning a name with its brand at the top of the market of windows and doors. Through close collaboration with architects and engineers, Portarredo has developed products that look into the future of home living, anticipating market trends and needs. In the initial project, studies and researches were merged in order to propose personalised design configurations for architecture solutions aiming to satisfy demanding expectations, different tastes and a variety of lifestyles. 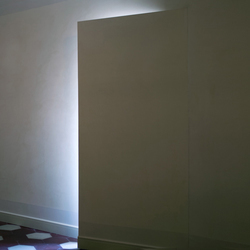 Linvisibile was born from this project, arising as the first-ever trademark in Italy to manufacture doors and locking systems totally flush to the wall. 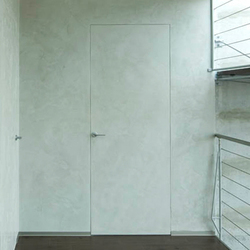 This exclusive and patented “invisible system” eliminates the need for doorposts, frames or exposed hinges, providing our doors with perfect smooth opening and motion. This practical and innovative system found its inspiration in the objective of hiding and “masking” locks and openings in the walls; this is the fundamental concept of Linvisibile philosophy. 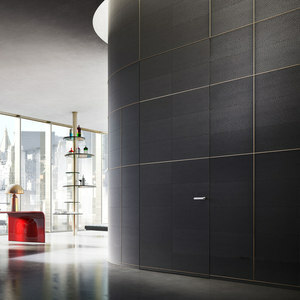 In fact, Linvisibile system is the technological evolution of an old concept: dungeons. 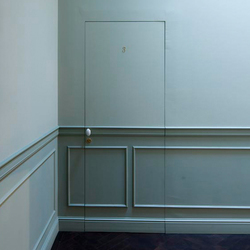 Doors that exist in perfect continuity with their setting, and were used throughout history to conceal from view, openings whose existence we shouldn’t be aware of. 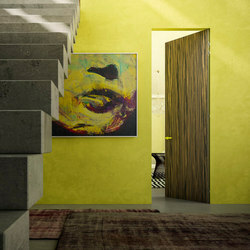 Over the years, the evolution of taste and architecture demands has turned doors into a key feature of interior design. Under this premise, Linvisibile continuously works and finds inspiration from designers to deliver tailor-made interior design pieces with maximum versatility and personalisation. In the spirit of constant evolution and looking into the future, Linvisibile has inevitably grown and expanded its horizons into the international scene. 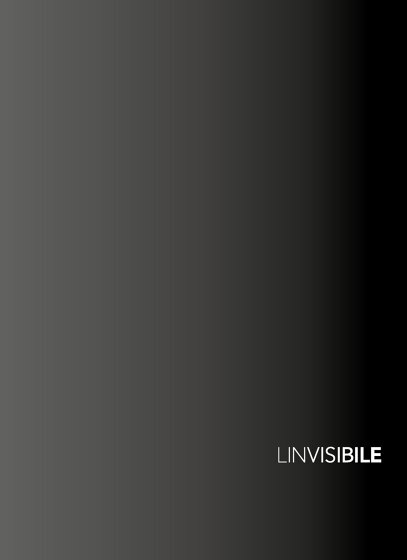 With this challenge in mind, Linvisibile has reinvented itself altogether…new image, services and product offer.  The world of is in constant innovation, and so are we. Linvisibile considers quality and scrupulousness in the choice of materials and working processes, essential elements for carrying out its operations. In the last years and against market trends, the activity of the internal R&D department has led a constant growth, developing ideas and innovations able to achieve the highest expectations and many times, forecasting them. Thanks to significant investments in human resources first, and technology after, Linvisibile’s R&D department is continuously studying new solutions, materials and innovative ideas. Thanks to the know-how gained in the field over the years and our great on-site experience, Linvisibile system is being continuously improved and perfected. Linvisibile products grow through the designers’ ideas: new locks, movements without noise, integration with home automation, customized finishes, more advanced ‘flatness’ effect, etc. These are just some of the latest features resulting from semi-robotic technology that, besides increasing our production capacity, further develops the system perfection and tightness. Linvisibile obtained the ISO 9001 quality certification from ICILA, the sole specific certification entity for the furniture and woodwork industries. At the same time, our network of technicians, suppliers and experts, always at the designers’ service, assures the quality of the services offered. 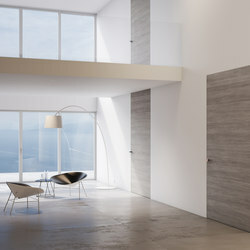 All the Linvisibile products comply with UNI EN 316, UNI EN 952, UNI 7961 standards.